Home Confetti: Today's Takeaway: Fruit "Cake"
Jessica of Pen and Paper Flowers was faced with the challenge of serving fruit salad as her daughter's main birthday treat. 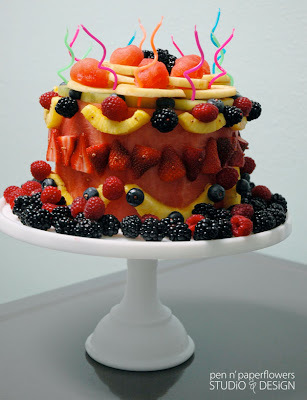 She came up with the great idea of making this beautiful "fruit cake"! Yummy and healthy, and perfect for the upcoming warm weather when all this fruit will soon be in season! Visit the original post here.